Fresh pear adds a juicy sweet component to this Asian-style lunch classic, that’s also ideal to pack in a school lunch or take to the office. Mix in a cup of whole-wheat pasta to add a healthy, filling carb. Combine all the ingredients for the dressing into a medium saucepan. Bring the mixture to a boil. Simmer until the liquid has thickened and reduced by half, about 15-20 minutes. Discard the jalapeno, ginger, and garlic. 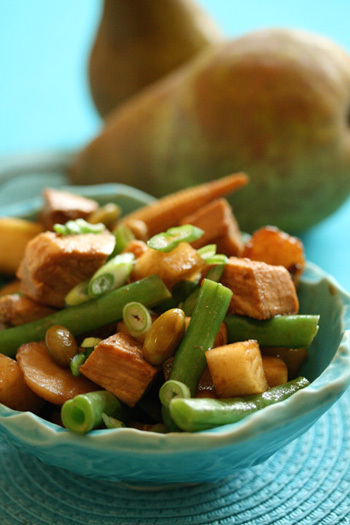 In a large bowl, combine the chicken, green beans, corn, water chestnuts, pears, and edamame. Add the warm dressing on top and fold the ingredients together. Garnish with scallions and enjoy warm or chilled. Nutritional Stats Per Serving (1 1/4 cup): 555 calories, 33 g protein, 85 g carbohydrates, 9 g fat (0 g saturated), 72mg cholesterol, 8 g fiber, 614 mg sodium.